Do You Have a Shy or Fearful Dog? – This Is How to Build His Confidence! The behaviour of a fearful dog can easily be confused with that of a ‘fearsome’ or aggressive dog. This is because a shy dog often starts ‘lunging’ on the leash or barking at humans, other dogs or objects triggering fear in them to scare them away as quickly as possible. Naturally, many shy dogs only seem disinterested, disheartened or ‘depressed’ and it may happen that a spoon accidentally dropped and clattering on the floor sends them skittering off behind the sofa to hide, or the noise of the vacuum cleaner may be excessively dreadful to them. There can be several reasons why a dog becomes shy. One of the possible reasons can be found in the dog’s past. If, for example your dog has been adopted from a shelter and his past is not known (or just the contrary, it is very well-known), then the unsociable behaviour of your little friend who was probably abused previously, needs no further explanation. If this is not the case, the timid behaviour is typically caused by a combination of a genetic predisposition, lack of experience or undersocialization. The latter two factors may leave a lasting mark in the early years of the dog and have an impact on the behaviour of the adult animal. As a conclusion, if the puppy doesn’t spend enough time around humans or other animals, is not exposed to a variety of sounds and noises and has no opportunity to experience enough caressing and petting, it may happen that he becomes an antisocial and timid adult dog or one that masks his shyness with apparent aggression. Let’s take a look at how you can help your dog if the problem is already present. Let’s see some exercises and tasks that may bring good results in overcoming fears or strengthening the dog’s self-confidence. One therapy method you can use is to: make your dog experience things and situations that trigger fear in him, naturally in a gradual way, trying to make an impact in a conscious manner, helping him develop a positive association to fear triggers. If your dog is afraid of meeting other dogs, try to take him to parks or other places where dogs can be found However, avoid direct contact with other dogs for a while. Just make him watch other dogs walking or playing nearby from a safe distance that is acceptable for your furry friend and give positive feedback if no fear is shown. You can even give him treats each time you experience some change or your dog is closing the distance to other dogs in a relaxed manner. You can help a dog behaving anxiously in a busy street by taking him from a quieter area gradually to more crowded streets, naturally by rewarding every little sign of improvement, thus turning his negative feelings slowly into neutral or positive ones, with continuous reinforcement. Dogs learn best from associations. You can build up a healthy level of self-confidence in a dog without confidence, by giving him and repeating simple tasks and rewarding good performance. Something like this will happen in the dog’s brain: “He says ‘down!’, so I get down and he praises me. I am a good boy, aren’t I? And once more. I am a good boy again!” This is, of course, a kind of obedience training as well – the same command, the same behaviour with the same result every time. A dog without self-confidence needs permanency and consistency. If your dog does not obey or exhibits resistance even with simple, well-known exercises, then don’t force him, for he may become headstrong and a voice raised involuntarily will immediately destroy the fragile self-confidence of a shy dog. Since your goal is to build confidence, use positive reinforcement only. Hand feed your dog! If you happen to have an extremely timid, adopted dog which doesn’t trust even you, try hand feeding him large bite size dog dry food or treats piece by piece. When he exhibits more trust in you, try touching and caressing his head with your other hand – if he moves away, you must be patient. 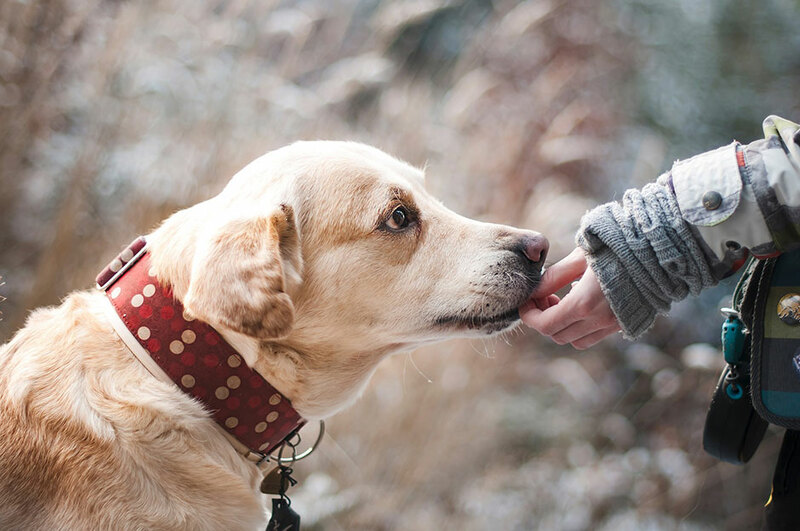 Sooner or later, the dog will associate the positive experience of the treat with human touch. ‘Treasure hunt’ is an excellent game to build confidence. Most dogs like finding their hidden toys and this is a complex exercise: it provides challenge, ensures a sense of achievement and builds confidence. First, you need to make your dog stay where he is and wait for you to hide the toy. This is an excellent obedience exercise: the command ‘Stay!’ works perfectly with your dog in this case (and can be quite useful in other situations as well). The dog will be excited searching for the hidden toy with the ‘Find it!’ or other short commands. Since we use this exercise to build confidence, the toy, naturally, should not be too difficult to be found. You can make the exercise easier by letting the dog see where you hide the toy – this will not spoil the experience or his sense of achievement and will still build confidence. So, whether it is the traffic, children, noises, other dogs or that your dog is afraid of you– there is help. If you can catch your dog’s attention and direct him consistently with the help of dedicated games or toys, you will succeed. The time and attention invested can transform situations triggering negative feelings in your dog into manageable or positive experience.